A serene way to spend a lovely afternoon or a pleasant evening is relaxing in a cozy outdoor nook. Homeowners can bring the indoors out by creating an extension with all the comforts of their home. Furthermore, by adding a novel, their inner bookworm may wiggle out in the setting of a soothing space. 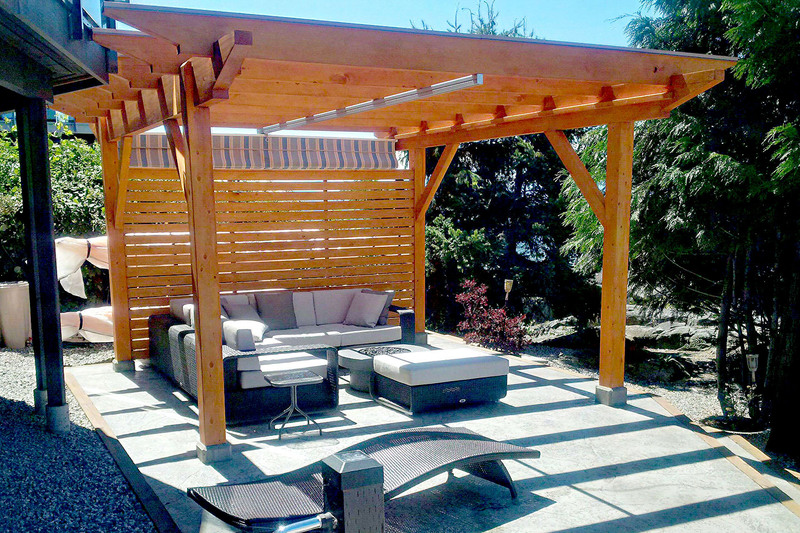 Homeowner Al Thiessen aspired to create a secluded spot to relax and unwind. Due to the green space in and around his home, a peaceful sanctuary was already in the making. 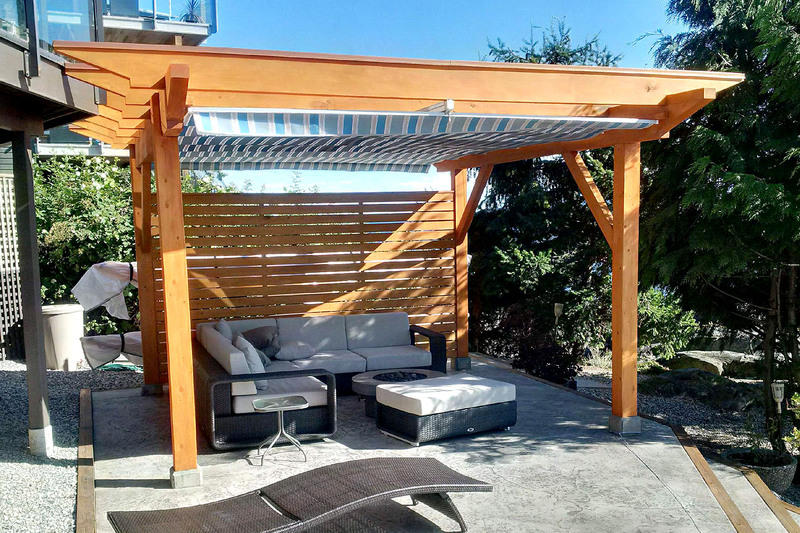 He designed a custom structure for a covered outdoor seating area and a decorative wall was also included in the pergola design for privacy and air flow. He realized the need to incorporate weather protection and his research led him to retractable shade solutions. After consulting with a ShadeFX Product Specialist, the final pergola design was stamped, and construction kicked off with his concrete pad. The cozy outdoor nook began to take shape. The partially covered area paired perfectly with seated cushions and plush pillows for comfort. The visually appealing fire pit adds warmth on those cooler days. Likewise, Al decided on ShadeFX to make use of the space during the sunny and drizzly days. 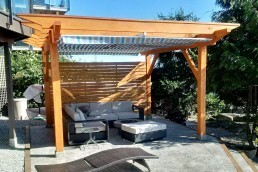 ShadeFX customized a retractable shade for his newly built pergola. Al easily installed the 16’ x 12’ manual canopy and it fit exactly how he imagined. 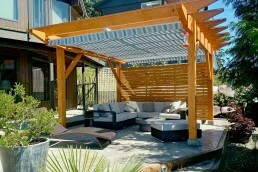 Using the Sunbrella Baycrest Sky fabric, the striped material added a personal touch. 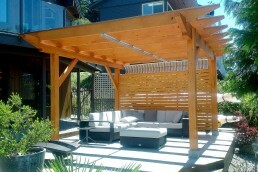 We are very happy with our decision to have ShadeFX custom fabricate a canopy for our pergola. From the very start the experience working with our product specialist was very enjoyable. 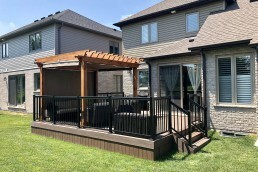 He provided us with good feedback and information about the ShadeFX canopy over numerous calls that also influenced the design of our pergola. The whole process went very smooth and once we settled on our design and authorized the canopy to go into production everything went as the product specialist described. We had no surprises the installation was very simple, and we are extremely happy with the end result. 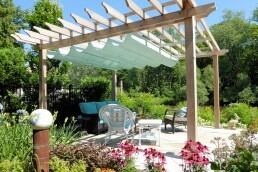 I would recommend a ShadeFX canopy to anyone looking to purchase a custom-made retractable canopy for a pergola. Surrounding yourself with tranquility is the best way to enjoy ‘me time’. A cozy outdoor nook can do the trick. The peace and quiet with fresh air allow for a blissful experience. Above all, reading a book or two will take you along a mindful journey. 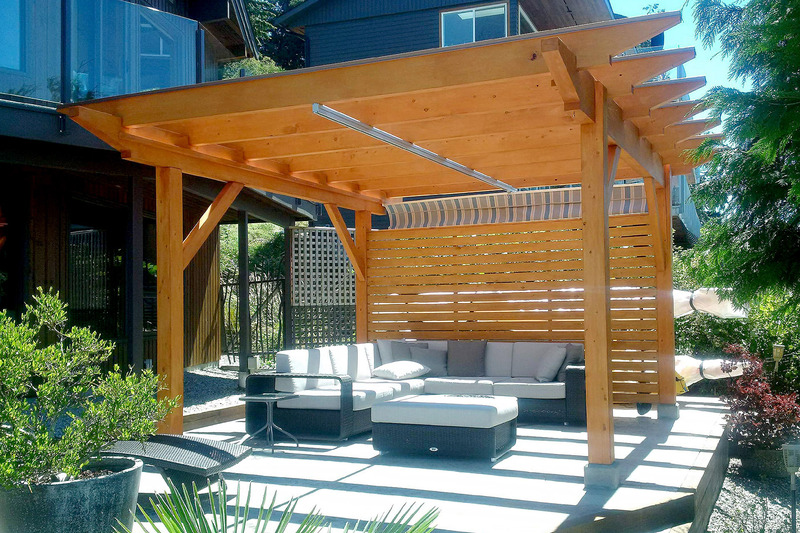 Let ShadeFX add shade to your zen space. Contact us today. 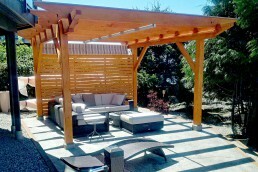 ShadeFX paired a custom pergola designed for privacy and airflow with a 16’x12’ manual canopy. 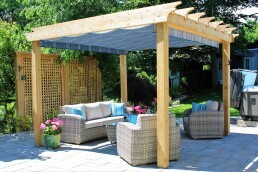 Adding a personal touch, a Sunbrella Baycrest Sky fabric was used. With plush pillows and a book, this cozy outdoor nook takes the homeowners along a mindful journey.